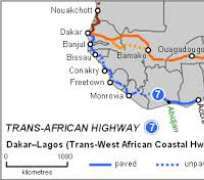 The Chief Executive Officer of the New Partnership for Africa's Development (NEPAD) Ibrahim Mayaki, has said that the ongoing 4,500-km Algiers-Lagos Trans-Saharan Highway construction would ease transportation. Mayaki further said the North-South transport corridor covering 2,800 km of road and rail networks between South Africa, Botswana, Zimbabwe, Zambia and Malawi would reduce transportation cost as well and boost intra-African trade. The UN correspondent of the News Agency of Nigeria (NAN) reports that Ibrahim Mayaki spoke at a joint news conference with the UN Under-Secretary-General and Special Adviser to the Secretary-General on Africa, Maged Abdelaziz. He said that the critical need to enhance Africa's cross-border trade and sustainable development informed the decision to promote the programme for infrastructure development in Africa. The NEPAD chief added that the programme, developed by the AU Commission, NEPAD and the African Development Bank, was designed to transform Africa and bridge its massive infrastructure gap. 'At the moment, Africa is the least integrated continent in the world, with low levels of intra-regional economic exchange and the smallest share of global trade,' he said. He said that the 51 Programme projects would lead to a robust regional system, fuelling international trade, job creation and sustainable economic growth. Mayaki also explained that those projects would be spread across the four infrastructure sectors, namely energy, transport, trans-boundary water, information and communication technology. 'Through those projects, Africa's global competitiveness would improve, thereby boosting socio-economic growth and development on the continent,'' he stressed. On the partnership between NEPAD and the Departments of Political Affairs and Public Information, Abdelaziz highlighted the work of the Departments in coordinating and integrating activities to promote African issues and development. Responding to reporters questions on NEPAD activities, Mayaki emphasised the importance of putting NEPAD on the international agenda as Africa's own development agency. He also stressed the need to mobilise resources to support the Programme for Infrastructure Development in Africa and called for greater efforts to address the 'massive' poverty in Africa. Answering a reporter's question on development, peace and security in Africa, both Mayaki and Abdelaziz spoke of the need for a durable peace that would enable Africans to benefit from the lofty objectives of NEPAD and the Mechanism, as well as the many other efforts and agendas being implemented. Abdelaziz also added that the Secretary-General, during his recent visit with the World Bank Group President to Africa's Great Lakes region, had reiterated the need to achieve peace and security in order for growth and development to thrive. The Mechanism, Nyirakobwa said, was a collective pledge by African leaders to address the challenges of bad governance, persistent poverty and underdevelopment. Also high economic growth and sustainable development through sharing experiences and reinforcement of successful best practices, through addressing identified governance shortcomings. Over the last 10 years the Mechanism had achieved increased citizen participation in political and economic management, among others, she added. As well, Nigeria, Kenya, Ghana, Rwanda, South Africa and Uganda had completed the first cycle of implementation and were now preparing for a second review.